I haven't wet shaved my legs for years now, not because I'm an advocate of hairy legs on women (I hate having hairy legs!) but because I suffer with terrible shaving rash. I remember begging my mum to let me start shaving my legs when I was at school and she told me once I started I'd regret it, and she was right. I don't mind having to shave my legs regularly if I want them to stay hair free, but what I do hate is the itchy rash I can get depending on how I do shave my legs. 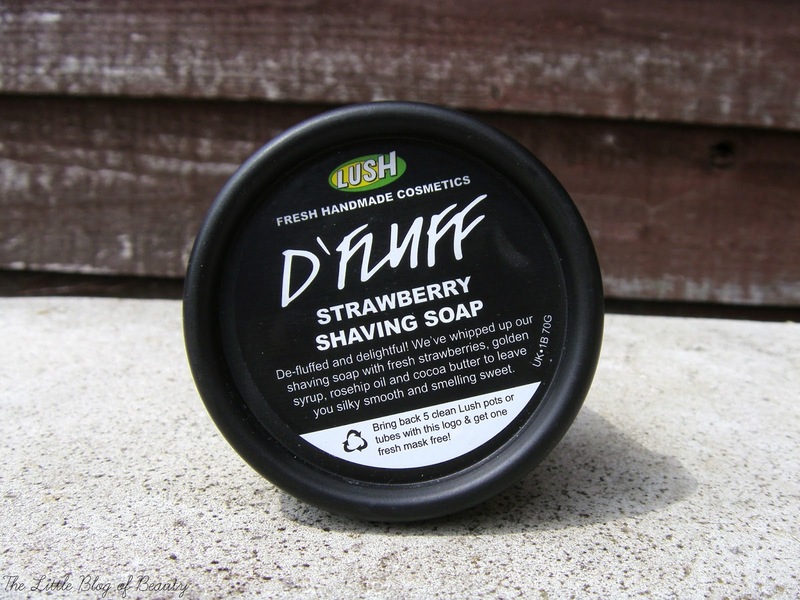 I use an electric razor as that minimises the rash that I get but when I was kindly sent Lush's new D'fluff strawberry shaving soap* by Lush Meadowhall I decided to give wet shaving another try. I don't think I've ever come across a product that looks or feels like this before. It looks like a strawberry mousse but then when you stick your fingers in it it's actually a lot more 'solid' than it appears. 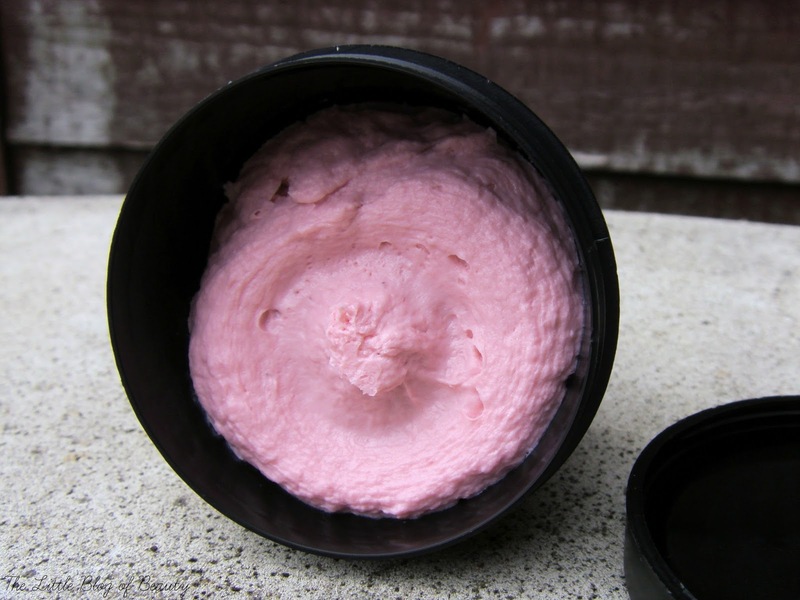 I was expecting it to be very soft just like a mousse but it is thicker and more solid than that. Oil wise it contains rapeseed, coconut, rose hip and sweet wild orange as well as cocoa butter, fresh strawberries and vanilla and rose absolute. This has an amazing strawberry smell and there's even little chunks of strawberry in it. A few weeks ago (I know, it's taken me ages to write this up!) I jumped in the bath to give it a try. If I do wet shave I usually shave with the hair rather than against it as this minimises friction and the resulting rash, but shaving this way is far from a close shave. On this occasion I decided to be brave and shave the way you're supposed to, risking a shaving rash, all in the name of product testing. I had a soak for a while first hoping to help soften the hair before I started. I also bought a brand new fancy razor that contains something like 4/5 blades to try and minimise how many times I'd need to go over each area. Is anybody else a little scared by how many razor blades razors contain now?! I didn't find that this produced a lather but was more like using a conditioner for shaving. It helped the razor to glide over my skin without any nicks, but still provided a close shave, and left my skin feeling really soft and moisturised. Unfortunately I did end up with a rash, but this is nothing against this as a product, I've never been able to wet shave with anything and not come out with a rash. On this occasion the rash wasn't actually that bad, although it may have helped that I made sure I applied aloe vera gel quite regularly. The actual red lumpy rash was quite minimal, in fact it hardly came out at all, but it itched like a b****. I was worried that this would a very expensive way to shave a large area like your legs as a small 70g pot is £5.75, but actually you don't have to use very much, so it will last a lot longer than I thought it might. If any men in your life suffer with dry skin on their face or irritation from shaving then this might be the perfect product for them to try. Although this didn't stop me at least getting the itching associated with a shaving rash it is a lovely product to use and I'd definitely recommend it.